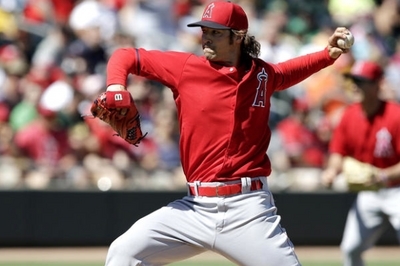 "It was nice," Wilson said after throwing three sharp and pitch-efficient innings in the Angels' 8-7 Cactus League loss to the Oakland Athletics in Hohokam Park. "I've been looking forward to this all off-season." Wilson had his worst year as a starting pitcher last season, going 13-10 with a 4.51 earned-run average, 151 strikeouts and 85 walks in 175 2/3 innings. He was pulled from his only playoff start after six batters and 23 pitches, giving up three runs and three hits in an 8-3 division series-clinching loss to Kansas City. Wilson gave up one unearned run and two hits, struck out two and walked none Saturday. He worked ahead in counts and needed only 41 pitches to complete his outing. Wilson averaged 17.7 pitches per inning, third-most in the major leagues, in 2014. "Low pitch counts are totally predicated on the hitting approach of the other team," Wilson said. "Today, they let me get a strike for the most part. The first pitch of the game was right down the middle. That set the tone that I was going to throw strikes. After that, they had to be a little more aggressive." One adjustment Wilson made over the off-season was to be less "side to side" in his delivery and to throw on more of a downward plane. He felt an immediate difference Saturday. "If you miss down over plate, that's more deceptive than missing off the plate by a foot on either side," Wilson said. "So if you miss down by a foot that's a better miss than to the side by a foot. So everything I've been working on in spring training is to stay down. "Only go up when you're trying to. I missed two pitches up today when I wasn't trying to go up. Everything else was pretty much right where I wanted it."